I am curious what the rigs are, commercial, homebrew, kits or vintage. I'll start with mine. I use a 3 transistor homebuilt I got from some of Lew McCoy's articles about 30 years ago. I upgraded it to a NTE128 final . Today I added absorbtion loop modulation which gives me AM phone if I like with no active components. I also have and use three vintage homebuilt rigs with tubes. One is a TNT, One a MOPA and one a 4 tube transceiver, all under 5 watts. The mopa is also a transceiver. All have AM capability as well a CW. What is on your shelf? 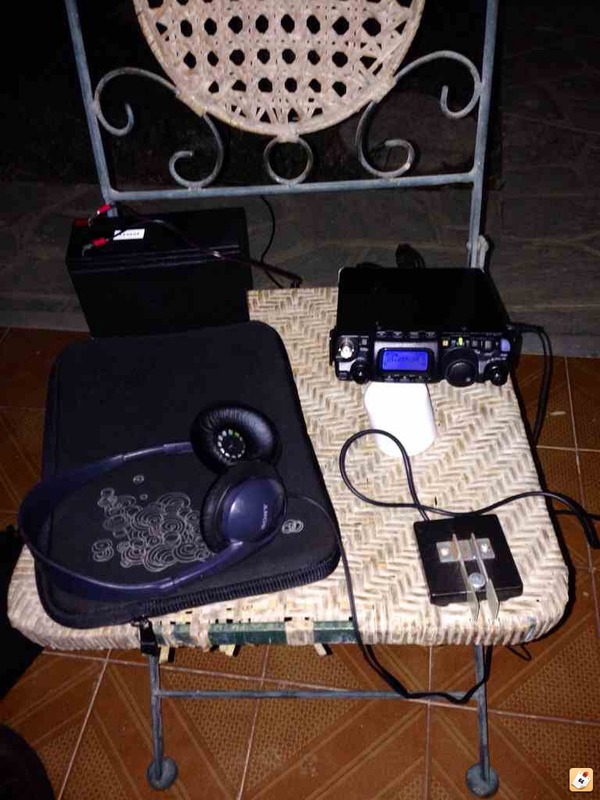 I use FT-817ND with a 500 Hz CW filter + Youkits HB-1B MK2 + Elecraft T1+ END FEDZ EF 20, EF10/20/40 + LW. In shack Icom IC-7200 + LDG IT-100 + CITY WINDOW (CW40100) + G5RV/ZS6BKW from W8AMZ. I run ATS-3B 6 band digital transceiver 5 w fits in an altoids tin 5 Oz than I have the H1-B1 from youkits 4 bander 5w the best receiver I have heard . I am using a newly acquired HB-1B with a 250 foot loop wire antenna. So far it has worked great. I am working on my CW proficiency and speed. I have a few QRP rigs but the best is my KX3 with a small ackumulator and solarpanels with regulator. For antenna I am using the old original VS1AA antenna (Windom like) since the ATU are capable of matching it on all the bands the antenna is capable of. I use two radials for each band and have had great fun with it. I have both a full size VS1AA and a half size for different needs and both works very nice with the ATU. The antennas is light weight since I don't need any coaxial cable so it's great for backpacking. I am mostly operating CW but KX3 really shines on SSB if the TX audio equalizer it set correct by enhancing high tones and suppressing low tones. I have very aggressive settings for the EQ and with the excellent compressor I get real good signal reports from overseas. 99 % CW operator ! The KX-1 is a portable favourite. It contains the battery and has a cute paddle attached. For antenna a 6 m fishing rod is enough. Shack - FT450D ( I know it can QRO but is always set at 5W. Good for CW with good (IMHO) digital signal processing, plays nicely with Ham Radio Deluxe v5 (The last free version) . The rig control via HRD is fast and convenient, saves wear & tear on the rig controls!! I don't use the fairly limited range internal ATU much, prefer to use external matchbox. Internal keyer is fine but not used because I'm determined to get my straight key work up to standard first. Portable - FT817ND with 300Hz cw filter, which is a revelation. It transforms the rig and it really helps protect my ears from excessive white noise/ general racket. (I'm fairly deaf and very interested in preserving what remaining hearing I have.) Can wind the power right down. Guerilla QRP - Youkits HB-1B 4 bander. An amazing little rig for the money. Variable filtration is effective. Only way to control output power I've found so far is to reduce power supply voltage a little. Unfortunately this also reduces audio gain. I switched to a pair of Sennheiser HD219 headphones and their sensitivity compensates nicely for this. If it is a really noisy environment, I switch my hearing aids to 'Loop' and they couple electronically to my phones and background noise is pushed a lot further into the background!! Various heaps of home brew crud, none of which approaches the rigs above. Also becoming much too quiet!! I use a IC-7000 dialed down to 5 or 3 percent (5 or 3 watts) but I am wondering if there is any RF output on the 0% setting like maybe 1/2 a watt. beside that I am working on a 38'special. I am trying to use all homebrew equipment, although some of them may be kits or derived from kits. So far I build a BITX20 and rockmite20 (designed the PCB myself). I am trying to go even smaller, now working on a PIXIE for 20 meters. Both my rigs are QRP capable down to 100 milliwatts - K2 and KX3. I had a KX1 and an FT817. My first ever long distance contact at over 2000 miles per watt is with the FT817 to Australia on phone. The heavy lifting was done at the other end by VK6LC on his 20m beam. My most recent is to Guam on the KX3 with an inverted L cut for 80m with 500 feet of radials and my most miles per watt is to Indiana at 100 milliwatts for 5370 miles per watt on a ZS6BKW antenna. Here I use the FT-817ND, ICOM IC-703+ FOR 10 & 6 METERS AND THE KX3. My ever long distance contact was on 30 meter with VK3IO who is using only extended double zepp at 100 ft = 30 meter high between 2 GUM Trees. Which gives me 3371 KM/WATT. Here I use only simple wire antennas and monoband vertical, hooked up to my chain link fence, which is 183 ft long around my lot or 55 meters long. You never know who you can work running QRP, that is the biggest fun of QRP power.